Functional a-DG Glycosylation Is Reduced in Individuals with B3GALNT2 Mutations. An examination of skeletal muscle cryosections from control, P1, and P2 revealed that glycosylated a-DG is reduced in individuals with B3GALNT2 mutations (P1 and P2) whereas b-DG was well preserved. Staining with the GT20ADG antibody against the core a-DG protein showed that the core was better preserved in P2 than in P1 as some variability was seen among the fibers. Credit: http://dx.doi.org/10.1016/j.ajhg.2013.01.016. Muscular dystrophy is a group of debilitating muscle wasting disorders that affects more than 70,000 children and adults in the UK. It is caused by problems with the proteins that normally work together inside muscle cells so that the muscle can contract and extend. For example, proteins inside muscle cells are strongly tethered to proteins outside the cells, by a bridge-like protein called dystroglycan. However, dystroglycan can only hold these proteins together when lots of different sugar molecules bind to it in a very specific way. This is called glycosylation, and is performed by glycosyltransferase proteins. Mutations in genes that control glycosyltransferase proteins can reduce the binding of sugar molecules to dystroglycan, causing the muscle cells to break. If this happens to enough cells in a muscle, it results in a form of hereditary muscular dystrophy called dystroglycanopathy, which is generally found in babies and young children and causes weakness and loss of movement. Our team is working with both genetic data collected from people across the country and model organisms to better understand the biological pathways and underlying genetics that result in muscular dystrophy. We hope this will eventually lead to potential new drug targets against these debilitating disorders. To uncover new genetic variants that cause dystroglycanopathy, we sequenced the exomes (the parts of the genome that make protein) of 5 children with the disorder as part of the UK10K study. We found genetic variants in two genes, B3GALNT2 and GMPPB, in different children with the disorder. Because these genes are known to be involved in glycosylation, we thought they may underlie the disorder. We decided that to learn more about these genes we would disrupt them in a living animal and study the effect. For this we chose to use zebrafish embryos because they develop externally, so unlike mouse embryos they are accessible for study at all stages. Also, they are transparent, so with some simple stains it is easy to see the different parts of the muscle tissue. To disrupt, or reduce the activity of the genes, we injected the embryos with morpholinos, which are short pieces of synthetic genetic material that recognize and bind to the RNA transcribed from each gene. When we looked at the embryos under a microscope, we found that the zebrafish with the genes b3galnt2 or gmppb disrupted were small and bent compared to healthy embryos. They also had small eyes, fluid around the brain and heart, and reduced movement. This is similar to the features seen when other dystroglycanopathy genes are disrupted in zebrafish embryos. We then examined the structure of the zebrafish muscle in detail by staining various molecules and structures. We found that the muscle fibers of zebrafish embryos with the disrupted genes were not parallel and tightly stacked like those of normal embryos, but disordered, allowing gaps to form between them. Finally, we used an antibody to show that there is less of the sugar-bound form of dystroglycan in the embryos with the disrupted genes, than in healthy embryos. Children with dystroglycanopathy also have less of this than healthy children. Therefore, the zebrafish embryos with the disrupted genes have structural and functional defects that mimic the symptoms of children with dystroglycanopathy on three levels: that of the whole animal, the muscle tissue, and the molecules. This, along with discovering mutations in both genes in additional children, and experiments on their cells, is very strong evidence that the mutations we found in B3GALNT2 and GMPPB cause dystroglycanopathy. There are now 15 genes that we know can cause dystroglycanopathy when mutated. This is not all of them, but with every gene discovered we learn a little more about the cause of this debilitating disease, and increase the number of children who will get a genetic diagnosis. Even more excitingly, knowing the genes involved gives us clues as to what treatments might be able to help these children, and the little knockdown zebrafish embryos could be used to test these treatments. 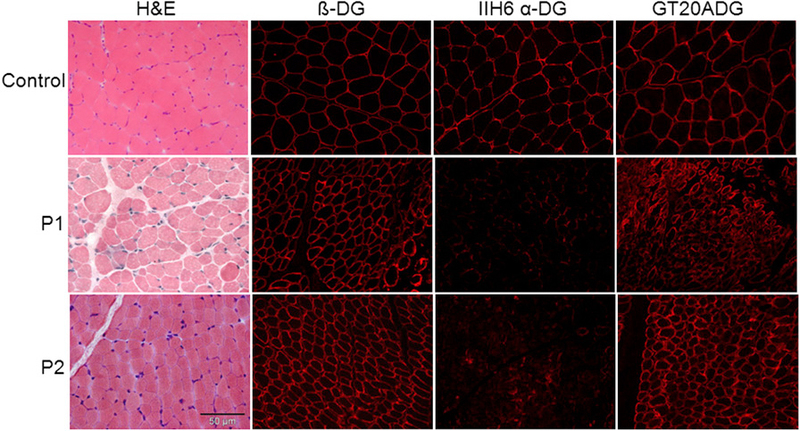 Mutations in B3GALNT2 cause congenital muscular dystrophy and hypoglycosylation of α-dystroglycan. Stevens E. et al. Am J Hum Genet. 2013 Mar 7;92(3):354-65. June 13, 2014 Communications Team Comments Off on What does it mean to be obese?